I've said it before and I'll say it again, I don't like coconut, and I don't like oatmeal. Last weekend we had a dinner party to go to and we were supposed to bring dessert (seems to happen frequently). I was busy painting in the garage and hadn't decided what to make yet when my friend emailed me a recipe for Oatmeal Cake that she was making for her daughter's birthday. I had all the ingredients on hand and my tall man loves oatmeal so I figured it would be perfect- I could take a hit for the team and make something with coconut and oatmeal. The first step is to boil some water and soak some oats to soften (then put your kids down to nap), then you use the creaming method (just like cookies), add the oatmeal, dry ingredients, and pour into the pan, bake it off- totally low-maintenance. Since the cake is flavored with cinnamon and nutmeg, I snuck in some whole wheat flour. The color and flavor of the spices mask the difference in taste from the whole wheat and no one is the wiser. While the cake bakes, you make the caramel-y frosting with a whole bunch of yummy things- butter, brown sugar, vanilla, evaporated milk, nuts and coconut. Spread it over when the cake comes out of the oven and enjoy as soon as it starts to cool. Then stand back and be totally surprised when I actually liked this cake! Really, with oatmeal (totally undetectable), coconut and nuts in the frosting, I LOVED this cake. It goes to show that I can really trust Naomi. And maybe I'm growing up. And that I need to make this cake again. The ingredients are cheap and easy, you could make it by hand with a big bowl and spoon. It's flexible- different nuts, or none, more coconut, or none, whatever. My son could make it. It's SO good too. I'm totally making this again, and maybe this week. I had hand surgery Monday and only have one good hand but this cake is that easy and delicious (and no chopping or anything) and I owe my peeps for taking care of me. This is good payback cake. Yum. I'm doing another review from CSN Stores. Yes you've heard about them all over the blogs, but it never ceases to amaze me all the things they carry! From modern bar stools to kitchen tools. We got my Bosch from them for Christmas and I'm looking forward to getting some accessories for it. If you have any favorites please let me know! I'm thinking about the Bosch blender or maybe some new bread pans. Any advice? Pour boiling water over oats and let stand until cool. Cream butter with sugars for one minute then add the eggs and beat until fluffy. Stir in oats and water mixture. Add flour with other dry ingredients and blend into creamed mixture. Pour into greased and lightly floured 9X13 inch pan. Bake 350 for 35-45 minutes or until done. Spread topping on baked cake as soon as it comes from the oven. In a small saucepan over medium heat, melt butter and add sugar. Blend. Add remaining ingredients and spread on baked hot cake. Place under broiler for a minute or two if you like a crisp topping. 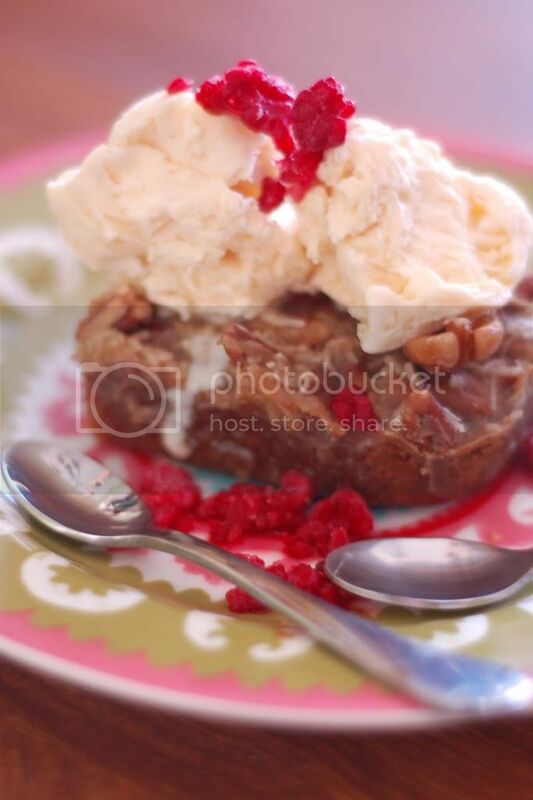 Serve cake with ice cream and fruit if desired. That would convert any oatmeal-hater! Actually, I do love oatmeal, but after years of trying to get hooked on steel cut oats for breakfast, I've realized that it's a bit much for me in the morning - a little too hearty, if you will. But for dessert, why not? But yeah, that cake looks divine! Yum! i love love that plate. So cute. Love you. I love oatmeal and coconut, so this sounds perfect! Hope you're recovering quickly from your surgery. Isn't it weird how that works out? You think you don't like something, then you try it in the context of a CAKE and everything changes! 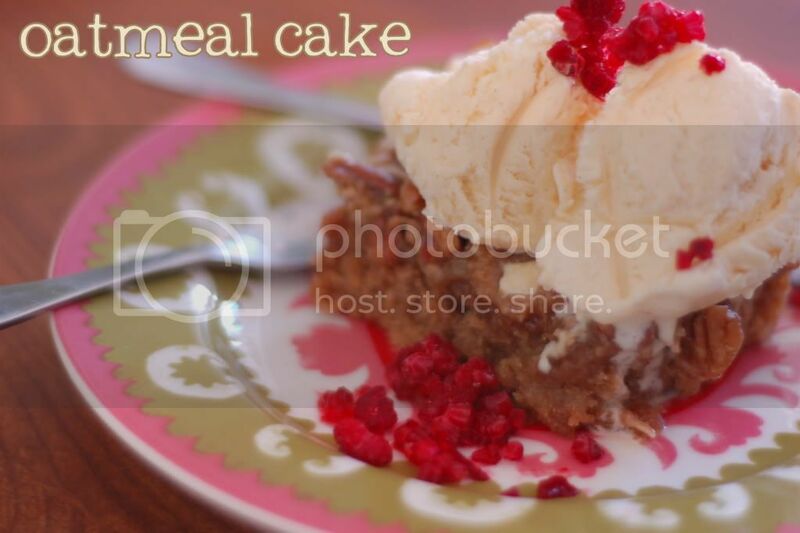 Looks like a really good recipe, and your photos are great! I have given your blog the Stylish Blogger Award! Thanks so much for sharing your recipes! I love following your blog. Oh my that looks and sounds so good. I love oatmeal, coconut and nuts. I would love this. Fun for you to like it. Oh my, I must make this! If it can win you over with it must be great. I have everything but the evaporated milk and I just found a recipe for that online. Score! OMG! Your cake sounds great! I love oatmeal and coconut too so must try this. Hope you have a quick recovery from your hand surgery! how very noble of you to bake up something with ingredients you are not fond of! Well, at least now you know u might like oats and coconut after all! Oh, this is my kind of meal...I love all of the flavors.Love your blog..its looks really so good just want to eat this...Yummy!!!! !